Known relatives: Elfman Strauss; Lisanna Strauss. Mirajane is the cover girl or drawing point of Fairy Tail. She is 19 years old, a former S-class mage, and the older sister of Elfman. When Mirajane was an S-class mage, she was known as "The Demon." However, due to a past incident involving the death of her younger sister, Lisanna, Mirajane somehow lost much of her magical ability and her will to fight. Given the recent event of Elfman regaining his lost abilities and Mirajane's increased confidence, Mirajane may someday regain her abilities and move forward with her life. 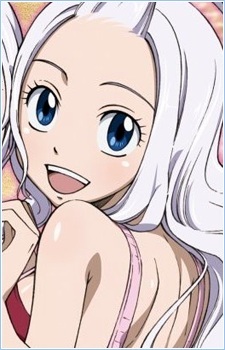 Mirajane plays a motherly role within the guild, and is often seen running the bar at the guild hall. She has rarely been shown to be in a bad mood, and can tolerate all of the guild's eccentricities. However, there have been a couple events that have disturbed Mirajane, including her discovery of the stealing of an S-Class job by Natsu, Happy and Lucy, and her later disappointment with Luxus following the destruction of the guild building. Mirajane got her name from an online video game Hiro Mashima was playing while he created her.